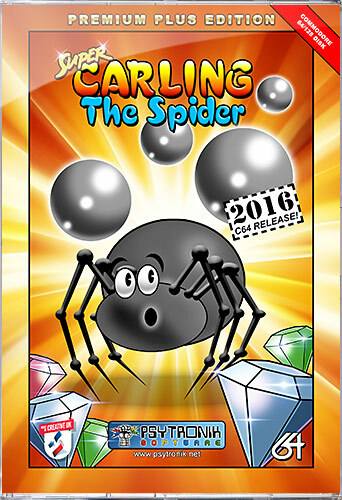 Psytronik Software proudly presents SUPER CARLING THE SPIDER - a specially enhanced C64 conversion of the popular VIC-20 release! This is a multi-screen platform game featuring a little spider called Carling. Your mission is to collect all the shiny diamonds on each screen while avoiding deadly spikes and marauding BALLS OF STEEL! Once you have collected all the diamonds you must head to the exit in order to reach the next level. Following his adventures on the VIC-20, Carling The Spider is BACK, this time on the C64! Super Carling The Spider is packed with new levels to explore, improved graphics and presentation, new soundtracks, enhanced gameplay features and much more! · New levels for Carling to explore!